I got a complimentary copy of this novel from the author in exchange for an honest review. It didn’t influence my opinion in any way although I am very happy to say I count Zoe Saadia among my Internet friends now. In the Aztec empire, the troubles are brewing. Their splendid capital city, Tenochtitlan, like the whole country, is ruled by a 13-year-old boy and his power-hungry mother, a Tepanec princess, who, allegedly, helped her husband into the Underworld rather sooner than later. She is a foreigner, she spreads terror and anger, she thinks she knows everything better – how not to hate her? While benefiting from its neutrality in the Texcoco-Tepanec War, many influential Mexica-Aztecs are growing wary of the way their city is becoming absorbed in the Tepanec Empire. Still their independence is slipping from their hands. What can be done? Meanwhile two young warriors arrive to Tenochtitlan with a girl at their heels. Kuini and Coyotl are quick to discover that something dangerous is about to happen in the great island-city they are visiting, and that they are expected to take an important part in it. Dehe is determined to win Kuini over and marry him even if it is the last thing she’ll do. In the royal palace Iztac-Ayotl has to fight for her future and happiness as well. Who will prevail – the mighty Empress or an insignificant ex-Second Wife, bound to be married off very soon? Will Iztac meet her beloved Kuini again? Will they be allowed to stay together? It might be actually my favourite part of the series (I haven’t finished the series yet so I say, very carefully, ‘might’), mainly because of Iztac-Ayotl and the small Dehe, a herb healer who accompanied Kuini to the mighty Tenochtitlan. Both ladies stole the show, one trying to survive in the dangerous palace ruled by her rival, the other finding her place in a big, foreign city among ruthless strangers. At the end of the second part, Crossing Worlds, Dehe’s actions foreshadowed her role a bit but only in this one the girl got more place and bloomed. I especially appreciated the fact that neither the refined, stubborn princess nor the homeless vagabond girl were perfect – they were portrayed with their strengths and weaknesses, flaws and virtues, becoming really intriguing, three-dimensional female characters. Also the romantic story arc, describing the love between Iztac and Kuini, was done very well, with respect and dignity. It was quite moving for me because it was real, without much sugar or fluff. It was a bit sad too, mainly because poor, young, infatuated Dehe was stubbornly repeating the same mistake over and over again. I wish her a lot of luck – she’ll need it. One of those series which are getting better and better with every book. I am looking forward to reading the next part and I strongly recommend to read all of them in order, from book one onward – otherwise you’ll be missing too much good stuff. 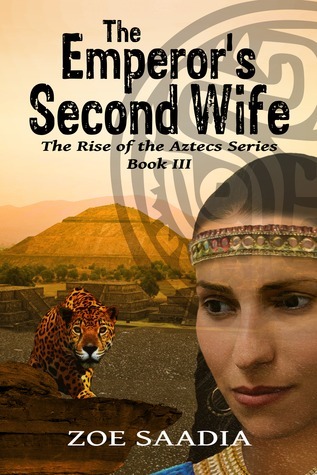 This entry was posted in book review, historical and tagged historical fiction, pre-columbian mesoamerica, series alert, the emperor's second wife, The Rise of the Aztecs, Zoe Saadia. Bookmark the permalink.